People often ask about the importance of having medical information of an individual and what specific information should readily be available in case of a medical emergency. So, this week let’s concentrate on this. 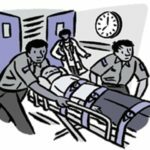 Medical emergencies could be induced by a variety of causes and often in emergencies key information is either forgotten or partially available that could delay immediate treatment. Globally a significant number of people die because of preventable medical errors and in situations where healthcare is limited, it is a huge contributing factor. Therefore, having the information is vital but equally important is to have it accessible at all times. Do you have all relevant medical info on yourself and your family? Can it be accessed in an emergency? Blood group: While a test can easily be done to know the blood type but in doing that precious time could be lost especially in trauma cases that result in severe loss of blood and need immediate transfusion. Allergies: Have a short description about the allergy. Medication: Dosage should be clearly stated, even over-the-counter medication or vitamins that are regularly taken must be listed. If you have a reaction to certain medications, list those as well. Blood pressure, diabetes, seizures, heart failure, Parkinsons, blood disorders (haemophilia, thalasemia, etc.) and other ailments should be noted. If an individual has a pacemaker or is pregnant always inform the attendant. Surgical history could be important, too, based on when it was done and the nature of it. An individual that has an uncommon condition should have a fact sheet handy that will help the medical attendant understand the symptoms. Doctor’s info: Family physician, specialist or anyone you’ve regularly visited. Their knowledge will aid the attendant managing your treatment at that point. The information should have their contact details clinic and cell number. Don’t forget to inform your doctor that you are listing them so they know they could be contacted in an emergency and are authorised to share your confidential medical records. Authorized person: Know who in your family or friends can be approached for additional information or for authorisation to carry out certain critical treatment. This information should be provided to your office HR representative too, so in case of an emergency at work they can reach out to the right person and get the approval or authorise them on your behalf. Always ensure the person being given this authority to act on your behalf is aware of this right. Where to store it and when to update? ‘When’ is the key; immediately update the information when it has changed for any reason. In the home and at your work place clearly inform others where to find it especially when stored at home. Also don’t forget to keep a copy of everyone’s medical info at the work place (if you get called in an emergency you can provide the info). Post a copy on the fridge or a bulletin board at home as well. ID bracelets and Dogtags are a great option and come in various forms that can either be worn or attached to a personal belonging (name, blood type, contact number and allergy mentioned). If you are a person who regularly jogs, walks or cycles, or into any other activity it is an important aid. Children, senior citizens, regular travellers should be given these as well. Online storage email, shared drive, etc. are perfect and easily accessible on smartphones and can quickly be shared with anyone accompanying a patient to the emergency. Where to find sample formats for emergency contact? A great pocket card tool is www.geticecard.com. Visit the site, fill the required information and save the card in the PDF format. Take a print out. You can print as many cards as you need and for all members of your family. Do an online search with the terms “emergency information format or card” and you will find scores of options; choose one that best suits your need. Many sites also offer to store your information online for a fee. If you are a regular traveller there are services that will retain your full medical history and you can share the pin code or reference number with the medical service provider. This addresses a need for privacy and your information not following in to the wrong hands.